This will be my last post of the week. My wife and I are off to navigate the midwest snow and ice. Hopefully we don’t get stuck on the “tarmac” for too long . . . . See you all back here on Monday. Ever wonder if an airport can go out of business? Well, now we know the answer. It can. Coventry Airport lies about an hour northwest of London by train (just east of Birmingham) and now, the group that runs it has decided to shut Coventry down. Sheesh. Coventry Airport was built back in 1936 and, like much of the country’s resources, turned into a Royal Air Force base during World War II. It sputtered along through the years with a smattering of air service here and there. Eventually, ThomsonFly began serving the airport and even based a few airplanes there to carry those pasty white Brits down to sun destinations. The airport handled this new surge of traffic in a way that seems similar to Long Beach. They built a temporary facility and tried to get approval for a permanent one. While Long Beach is now moving ahead, Coventry’s permanent facility was denied thanks to the meddling of environmentalists and the anti-noise crowd. Things went downhill fast. ThomsonFly eventually pulled out last year. The only other airline in town, Wizz Air, had already suspended flights. So the airport was left without a terminal and without any passenger service. The city still owns the land, so they can do something with it if they so choose. My guess is that it will reopen one of these days, but I have yet to hear of any definite plans. My biggest concern about this whole thing is the fate of Air Atlantique. These guys operate a bunch of classic airliners out of Coventry including some Dragon Rapides, a couple DC-3s and DC-6s, and more. I tried to get in touch with them, but they haven’t responded. It looks like despite some hiccups right around the closing, they’re powering ahead elsewhere. So, let’s all hope that this doesn’t just become another empty piece of pavement, and that it does in fact come back to life one of these days. Erm, Coventry is more then two hours north west of London. I mean by train. Should have been more clear, so I’ll update that. To be fair, Coventry is a sh1thole. Those wishing to escape are than adequately served by surrounding airports. And it is a bit more than an hour from london – took me 6 and a half hours tocycle there in September! Merry Christmas everyone (or whatever else takes your fancy), and cheers for another entertaining year, Cranky. Never mind how far it is from London. More importantly, it’s 15 miles from Birmingham Airport which has buildings and aeroplanes and fancy stuff like that. So Coventry has no real chance. I can’t think of any good reason why it should come back to life as an airport. 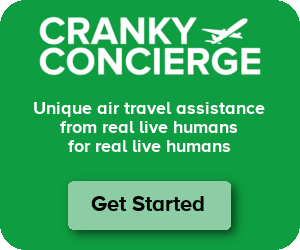 Re snow in the mid-west… I hear there’s a Concierge service that can help you out if needed. Might want to look into it. Do you think that anything that environmentalists and the anti-noise crowd oppose is wrong? I don’t know anything about the Coventry airport situation, but it didn’t sound like it was a vibrant airport to begin with (look at the distance from BHX and the large selection of airlines and destinations there), and frankly I don’t think we Californians should be in the business of criticizing the residents of that part of the world if they DON’T want additional noise or pollution. It’s not OUR backyard. Maybe write about Palmdale…oh wait, you already did, and there you seemed to not think it needed a commercial airport. We missed our connection today, but the good news is that there is another flight with room on it later. Lucky. I don’t think we Californians should be in the business of criticizing the residents of that part of the world if they DON’T want additional noise or pollution. It’s not OUR backyard. Maybe write about Palmdale…oh wait, you already did, and there you seemed to not think it needed a commercial airport. Wait a second; while I certainly don’t see the need for a commercial airport in Palmdale at this time, I absolutely wouldn’t want to see the airport shut down. I don’t want to see any airport shut down. That airport has been in Coventry since before WWII, so my guess is that there are very few people if any who can claim seniority. We’ve seen enough of a loss of runways over the years – and I will always support the efforts to keep the existing ones alive. Coventry (CVT) made the mistake of trying to jump on the low-cost bandwagon just like every other provincial airport in the UK. For a while, CVT even called itself “West Midlands International Airport” just because they’d managed to attract a couple of token pax services (that anyone with a brain knew couldn’t last). Using this false and egotistical status to jack up the fees they charged to their bread-and-butter General Aviation users was also a serious error, but again a move typical of provincial low-cost bandwagon jumpers, seen elsewhere in SOU, BLK, HUY etc. Aviation is the most short-term-thinking industry on Earth, IMHO, and this is a shining example of it. I sympathise with the staff who are out of a job just before Christmas, but not with the greedy, blinkered, delusional management who clearly thought they could be the next Stansted. Coventry can be easily 2 hours from london, its only something over 2 hours by national express.. of course depending on traffic, but the true is that Luton, East Midlands and Birmingham airports are just too close and its not essential there..